More and more often, women who consider adoption for their babies are doing so in the hopes of pursuing an open adoption, or an adoptive scenario that involves communication between the birth parents and adoptive parents. Recent studies show that more than 9 out of every 10 women who ultimately choose adoption for their babies request some degree of contact with the adoptive parents. Why? The benefits of open adoption for birth moms are numerous, but below we’ve listed some of the most notable reasons for a woman to feel more comfortable with an open adoption. 1. She gets to choose her child’s adoptive family. that can provide that. It’s her right, then, to choose an adoptive family that she believes will give her baby the life he or she deserves. While American Adoptions helps adoptive families to create adoption profiles, an open adoption allows a woman to get to know a prospective adoptive family before placement to ensure that they’re the right fit for her child. 2. She will know how her child is doing after the adoption takes place. As recently as the late 20th century, most adoptions were still closed and secretive, bringing women and adopted children alike a sense of shame. In an open adoption, a woman can feel confident in her choice as she receives updates on her baby’s progress and sees him or her being raised in a happy, healthy home. She won’t have to wonder if she made the right decision, because she’ll be able to see the proof that she did. In addition, the child will not have to wonder about his or her birth mother, as she can send along updates as well. 3. She will be able to remain involved in her child’s life. If a pregnant woman and adoptive family both agree, an open adoption means that a woman can still have a relationship with her baby. This does not mean that she can regain custody or that she can parent in the traditional sense, but it allows a birth mother and child to get to know one another. Adoption can come with a lot of questions, particularly for an adopted child, and to have this extra source of love in one’s life can only be a positive. 4. She will be able to be confident that her child knows their adoption story. 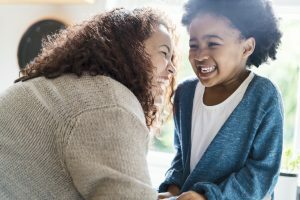 In order for an adopted child to feel proud of his or her adoption story, it’s important that an adoptive family keeps the lines of communication open from the beginning. In an open adoption, a child will always know where they came from, how much love went into the adoption decision, and that there was never a second where they weren’t wanted. An open adoption relationship can look a lot of different ways, depending on the individuals involved. The amount and degree of contact between birth parents and adoptive parents can vary and can change over time depending on each party’s comfort levels. Just like any other relationship, an open adoption can evolve. To speak with a social worker about what an open adoption could look like for you, please call American Adoptions at 1-800-ADOPTION. I have a friend who gave birth to a baby girl. Her boyfriend left them for another girl. She wants to consider the adoption idea so she’d ensure that her daughter will have a good life. My mom wants to adopt the baby. Any help on this? Hi, Joy — Your friend can always reach out to our adoption specialists at 1-800-ADOPTION or contact us online for more information about the adoption process. Our specialists can answer whatever questions she may have and help her decide if adoption is the right path for her.